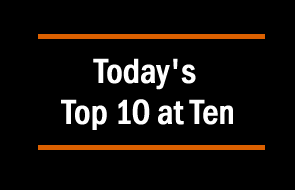 Today's Top 10 is a guest post from Martien Lubberink, an Associate Professor in the School of Accounting and Commercial Law at Victoria University. He previously worked for the central bank of the Netherlands where he contributed to the development of new regulatory capital standards and regulatory capital disclosure standards for banks worldwide and for banks in Europe (Basel III and CRD IV respectively). These are testing times. Brazil, China, oil, and a looming Brexit contributed to increased levels of economic uncertainty, fuelling financial market turbulence. The good thing is that markets have calmed. As I write, the VIX is below 20, down from its peak value of 28 this year on 11 February. The bad thing is that people in power use uncertainty to push their own interests. My Top 10 shows how the recent market turbulence sorted the men from the boys, as some countries kept a steady hand in the face of adversity. Other countries knee-jerked to pander to the interests of banks. The U.S. stress test introduces a severely adverse scenario, characterized by a severe global recession in which the U.S. unemployment rate rises five percentage points to 10 percent, accompanied by a heightened period of corporate financial stress and negative yields for short-term U.S. Treasury securities. Banks are expected to cut payout ratios. 2) At almost the same time as the Fed stress test announcement, Neel Kashkari, the new president of the Federal Reserve Bank of Minneapolis, took the idea that banks should be better prepared for adverse conditions to an entire new level. Quashing the idea that post-GFC bank regulation ended the era of taxpayer funded bank bailouts, Kashkari initiated bold and transformational plans to eradicate too-big-to-fail banks. Among these plans are breaking up large banks into smaller, less connected entities; and turning large banks into public utilities by forcing them to hold so much capital (25% of assets) that they virtually can’t fail. 3) One sign that U.S. regulators like Kashkari are on the right track is the flak they attract from bank lobbyists. One pundit, Richard Bove, called Kashkari plans “dangerous”. More importantly is the response from The Clearing House. Joined by influential associations like SIFMA and the American Bankers Association, it published a 151 page letter that blasts initiatives to make banks more resilient as “excessive”. If commercial companies are unable to obtain long-term financing for their projects on acceptable terms or the cost of raising long-term debt rises significantly because of excessive TLAC requirements, those excessive requirements could have an adverse impact on the economy as a whole. If we use lending shares as a scaling factor, raising capital requirements on the top 30 potential G-SIBs by 1 percentage point over eight years leads to only a modest slowdown in growth. GDP falls to a level 0.06% below its baseline forecast, followed by a recovery. Empirical work carried out by the ECB on the impact of higher bank capital requirements on the euro area economy identifies some adverse impacts on loan supply, although this appears to be relatively limited in economic terms. 4) So Neel Kashkari has a point, and the IMF backs him. It documented last year that big banks benefit from a too-big-to-fail subsidy, which, if taken away would make banks even less profitable than they are now. And low bank profits are a worry, at least for European banks, as the European Banking Authority pointed out this week in its most recent risk report. 5) Australia is the other country that consistently shows signs of having learned from the global financial crisis. Although Australian banks raised over $15 billion in equity, its top bank regulator promotes higher bank capital ratios. This all in response to the recommendation of Australia's Financial System Inquiry report to make the banks of Oz unquestionably strong. 6) Europe, however is an entirely different story. Since Jean-Claude Juncker became President of the European Commission, the European attitude towards banks has softened. The most clear manifestation of the dovish attitude is Jonathan Hill's (a revolving door ex-lobbyist) appointment as EC commissioner for financial services. Under Lord Hill, Europe relentlessly pushes a bank-friendly agenda. A first sign of this agenda was the consultation on the possible impact of new bank regulation on bank financing of the economy. The obvious reason to redo the Basel MAG study is to show that the latter is wrong: Jonathan Hill wants to make us believe that capital requirements hurt the economy as a whole. 7) Also remarkable is the change of the UK position on banks. Shortly after the onset of the GFC, the UK was all in favour of high capital requirements. But, in the recent past, thanks to Chancellor George Osborne, the UK has become much more bank friendly. Last year, he called for an end to bank-bashing and he forced out Martin Wheatley, the tough-talking head of the Financial Conduct Authority. If we don't end too big to fail we can't support a financial sector of this size. I could be wrong, but I think Mark Carney is brave in claiming that the too-big-to fail problem was solved in just two years under his watch at the Financial Stability Board. 8) 2016 would be the year that freed Europe from taxpayer-funded bank bailouts. From this year onward, troubled banks should impose losses on equity and debt investors. This, of course is a major achievement, many countries on this planet will still bail out failing banks. Unfortunately, about a month into the new year, the European Commission allowed the Italian government to guarantee bad debts of banks, which frustrates plans to break the toxic link between governments and banks. This deal, and the haphazard way Portugal was allowed to bail-in some (but not all) senior Novo Banco creditors does not bode well for the future of EU bank rules. 9) The European Commission also leaked a document that appears to soften bank capital rules by allowing a large majority of European banks to apply fairly minimalistic capital requirements, according to this blog post. In the meanwhile, Daniele Nouy of the European Central Bank joined Jonathan Hill's bandwagon: “All other things equal, capital requirements will not be increased further,” Nouy said. 10) Though I may complain about Europe's flip-flopping on bank resolution, at least it makes an effort to free taxpayers from the fallout of failing banks. India, for example, may represent many other nations that still rely on bank bailouts. Last week it emerged that the Indian government is considering infusing as much as $34 billion into poorly performing state banks. Some countries never learn. A good situational scan. The banks are businesses. Like all others, they’re enterprises for private profit. But they also have a number of radical differences from other businesses. They established, and continue to dominate, our capitalist system, via the availability and deployment of capital. (The rights and wrongs of the system aren’t the issue.) This role in capitalism gives the banks immense influence in public policy. Because of their role and the influence they have amassed, they have become singularly highly privileged in global affairs. As any business would, they have used, and continue to use, this position of privilege to their benefit. The question we face now is whether the dual benefits of their privileged position - on the one side to the functioning of our economic system, and on the other side, to the banks themselves – have become unbalanced. Perhaps the required economic (and ethical) balance no longer functions appropriately. The banks do not fight their corner for the good of the society in which we all live; they fight it for their own benefit. And regulators, governments and central banks, in general, have hit the mat in the first round. However we know, if we have learned anything at all from the GFC and the increased global economic instability post-GFC, that the privileges banks enjoy are unsustainable. And that these privileges are an increasing, indeed menacing, source of instability within our whole society. Very well said. With more and more information coming out on the overall dominance of banks and their influence, how long until we see our own pollies start to take notice? With a banker sitting in the big chair, likely quite a while, but an election is beginning to loom. How early can public education begin, to have an impact? To understand the position of the Banks, read up on the history of the Church. The Banks have their " The Emperor Has No Clothes " moment coming. Its not if but when. Their 'Bishops', in the form of Economists, try to convince people to keep the faith, but reality has a bad habit of ignoring theory. #2. "Kashkari initiated bold and transformational plans to eradicate too-big-to-fail banks" Yes please we need this. New Zealands big four should become New Zealand big 20. Mostly locally owned. And yes a 25% capitalisation. Maybe more. I really do hope Wheeler takes this one in. 5: For the big four banks, only 16 per cent, on average, of a real estate mortgage is counted when measuring the bank’s capital ratio. This is rising to 25 per cent next year. Is this what is meant by "unquestionably strong"? I don't think so. I think it means the Aussie bankers have totally outwitted the bureaucrats (who, by their nature, are easily frightened). A significant problem is that when one operation goes down it usually means they all go down. Witness the mass demise of the New Zealand finance companies. Also there is little incentive for the senior executive team or the directors to run a safe bank. The salaries are such that secure retirement is possible even if you only last in the job for a year. So get in, look impressive for a moment, pump up the salary and bonuses, it don't matter if it is a house of cards because you will be gone laughing, loaded with loot, very soon. If you believe that all the IOU's conjured up by the banks can be met by the real world economy then good luck. The rubber is about to it the road. Its just a fairy tale. Negative interest rates are just the opening salvo of a 'FIRE' sector thats completely overwhelmed the capacity of the real world to comply. Have a look at some of those promises (iou's) disappearing right now via pension schemes in the US. If it's a number on a screen then good luck redeeming it for anything of value. Economics is heading for a massive 'localisation' event. Agree. The fantasy will continue however until it cant, as everyone just wants to believe that the solutions to the problems they are making today will keep moving into the future. I really wonder on pensions as well. I I mean who really can believe that all the pensions out there will be paid? As we watch many US public pensions seem about to implode and it hasnt got rough yet. So true, no chance in my mind! Though, that generation has lived through the most comfortable era in history. What about the kids of today, they have no idea what is coming and would struggle to survive if the internet went down. "Quashing the idea that post-GFC bank regulation ended the era of taxpayer funded bank bailouts, Kashkari initiated bold and transformational plans to eradicate too-big-to-fail banks. Among these plans are breaking up large banks into smaller, less connected entities; and turning large banks into public utilities by forcing them to hold so much capital (25% of assets) that they virtually can’t fail." Neel Kashkari has been an investment banker, mostly under Goldman and has been with Hank Paulson at the Treasury and was the key architect of the Banks bail out. Now he has flipped sides. Wonder why ? And how is the Banking community in the US reacting to his proposals ?